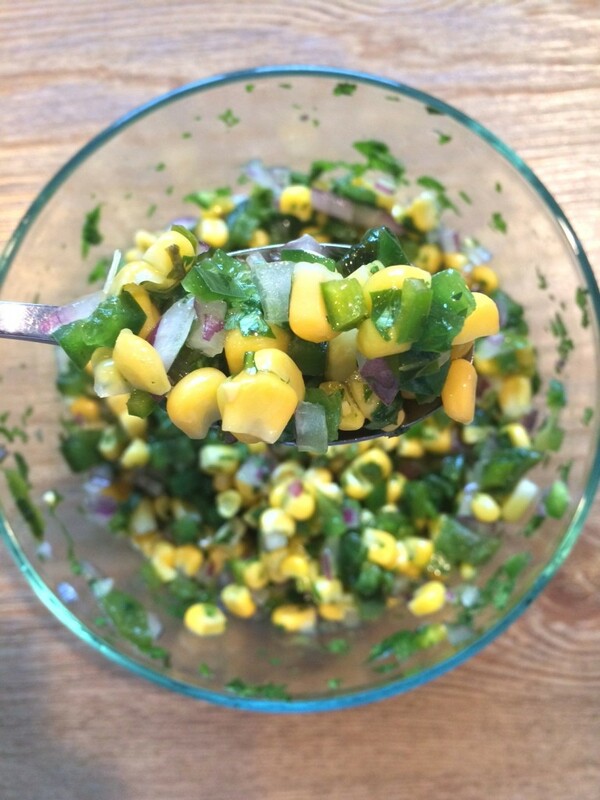 This delicious, bright and seasonal salsa is best made in the summer when sweet corn is readily available, but it can be just as easily made year round by using frozen corn. I was assigned salsa for a Halloween party last week and this is one of the three that I made. It doesn’t pack a ton of heat, so it’s suitable for almost everyone, but it does have lots of fresh, slightly charred flavor that goes perfectly with tortilla chips or over baked chicken or fish! Great on chips, fish or chicken! Place poblano pepper directly onto the grates of your stove and turn burner on to medium-high heat. Use tongs to rotate the pepper a few times until most of the pepper is charred. Remove pepper from heat, place in a bowl and cover with plastic wrap. While pepper cools, bring a small pot of salted water to a boil. 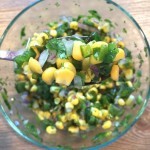 Add corn and cook for 4 – 5 minutes until cooked, but still al dente. Remove from heat and let cool. When corn is cool enough to handle, remove kernels from cob by standing the ear of corn up on one end and cutting from top to bottom. Peel and discard the charred skin from the cooled poblano pepper. Dice into 1 inch pieces. 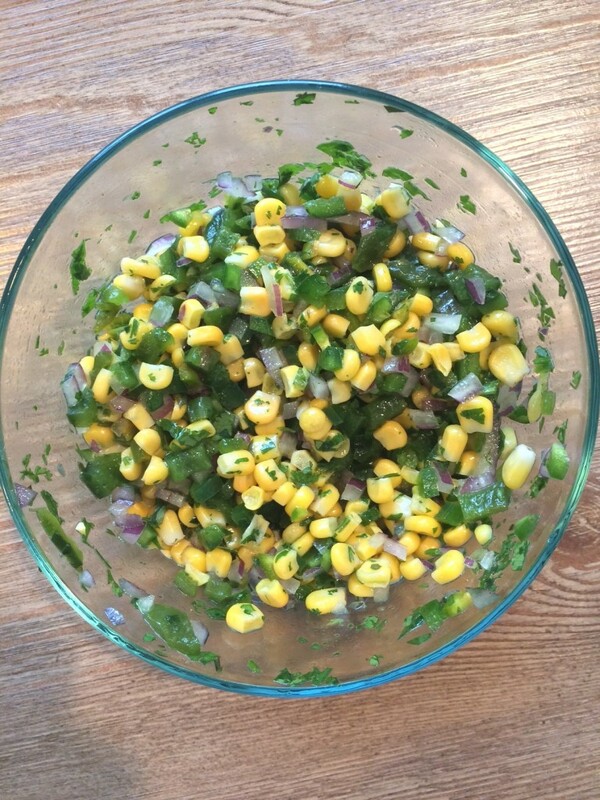 In a medium bowl, combine poblano, corn, jalepno, serrano, onion and cilantro. 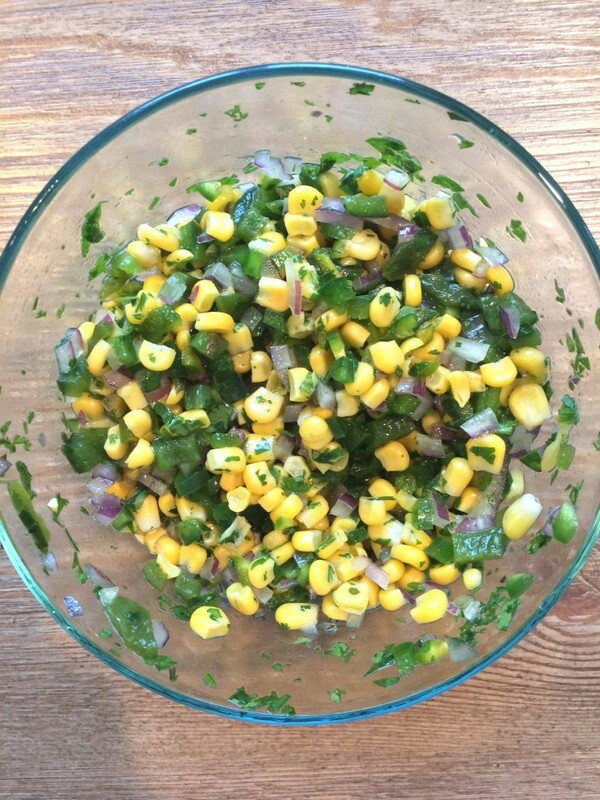 In a small bowl, whisk together vegetable oil, lime juice, sugar, salt, cumin and black pepper. Pour oil mixture onto vegetables and toss well to coat.